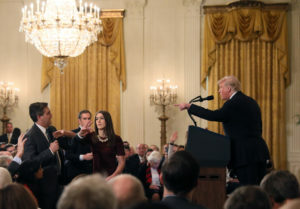 NEW YORK — CNN took its access battle against the Trump administration to court on Tuesday, demanding the reinstatement of correspondent Jim Acosta’s White House credentials because their revocation violates the right of freedom of the press. The White House, never shy about picking a fight with CNN, says bring it on. “This is just more grandstanding from CNN, and we will vigorously defend against this lawsuit,” said White House press secretary Sarah Sanders. The administration stripped Acosta of his pass following President Donald Trump’s contentious news conference last week, during which Acosta refused to give up a microphone when the president said he didn’t want to hear anything more from him. Sanders initially explained the decision by accusing Acosta of making improper physical contact with the intern seeking to grab the microphone. But that rationale disappeared after witnesses backed Acosta’s account that he was just trying to keep the mic, and Sanders distributed a doctored video that made it appear Acosta was more aggressive than he actually was. Trump called Acosta a “rude, terrible person,” and Sanders on Tuesday accused Acosta of being unprofessional by trying to dominate the questioning at the news conference. For its part, CNN believes the White House is trying to silence a reporter. “Mr. Acosta’s press credentials must be restored so that all members of the press know they will remain free to ask tough questions, challenge government officials and report the business of the nation to the American people,” said Theodore Olson, former U.S. solicitor general and one of CNN’s lawyers on the case. “The president of the United States should not be in the business of arbitrarily picking the men and women who cover him,” said Olivier Knox, president of the correspondents’ group. CNN would seem to be on strong legal ground, said Katie Fallow, senior staff attorney at the Knight First Amendment Institute. During the Nixon administration in the 1970s, the Secret Service tried to deny credentials to a reporter from the Nation magazine because he had been involved in physical altercations, but was overruled by the D.C. circuit court, she said. “I think it’s important, particularly as the president continues to push back on the role of an independent press, to stake out the legal rules that should govern this and not let the president block people from speaking based on their viewpoint,” Fallow said. Because of this, CNN also has a strong argument to overturn the White House stance based on due process grounds, said Jeff Robbins, a lawyer who focuses on media issues for the firm of Saul, Ewing, Arstein & Lehr in Boston. “Pick your poison — it’s the Fifth Amendment or the First Amendment,” Robbins said. Legalities aside, the president has never been afraid to fight the media, believing the stance resonates with his supporters. And Acosta is one of the reporters they dislike the most. Former White House press secretary Ari Fleischer, who worked for President George W. Bush, last week dismissed the supposed physical contact with an intern as a reason for banishing Acosta, but said he doesn’t belong in the press room because he’s essentially like an opinion columnist instead of a journalist. Acosta is a “left-wing activist” more interested in disrupting the president than in asking serious questions, said Brent Bozell, president of the conservative media watchdog Media Research Center. “No one reporter has a constitutional right to access the press briefing room,” Bozell said. “It’s the prerogative of the White House to decide who gets a pass and who does not. Sanders noted that nearly 50 other people from CNN have White House passes.